How about a quick-to-make, bright, Christmas card? 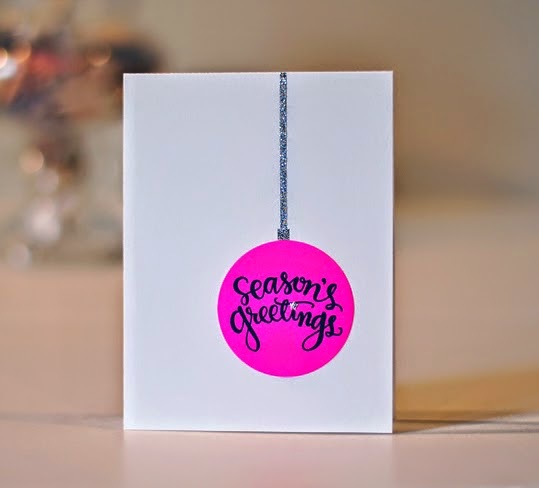 Covered some white card stock with Hero Arts neon pink ink, stamped the sentiment from Simon Says Stamp Peace on Earth, and die cut a circle. The silver is from a sheet of adhesive glitter stuff that I found at Paper Source. Trimmed a cord and the top of the ornament and die cut a teeny star for the dot on the "i." Fun to read the comments from my last post. I have the best readers! Thanks. bonus points that it is postal friendly. How very festive and fun. Gosh Joan, I didn't want to like this, since it means that I have to get neon ink pads...GRRR...but I do. Very cool, love it with the glitter. Really cool, clean and modern! Now you've inspired me with ideas of what to do with all my Neon Ink Pads...thankyou!! So nice and easy plus lots of ways of changing it up using what I have on hand. The card has a nice balance to it. Neon for Christmas?! Shut.up. So fabulous. I am inspired by all of the cards that you are making. Simplicity is best. Love this card Joan. Simply fabulous and fabulously simple. Therefore, perfect. I just shake my head at how great this is. So simple.